Your wedding day is a day you'll remember for the rest of your life and because of that you'll want it to be extra special with a venue that captures the special moment. That's where Just Maui Weddings™ can help by offering a variety of Maui wedding venues and packages to suit anyone looking to make their dream Maui wedding a reality. Each Maui wedding venues has its own charm and character, a church service might be traditional but sometimes you have to break tradition to get the dream wedding for you. And we have Maui wedding locations venues to suit all kinds of ceremonies and budgets, let's take a look at them in more detail. Our Maui weddings venues encompass two areas of the island the first group of venues can be found around the South Shore close to Wailea and Kihei. There's three stunning and very different Maui wedding venues for you to choose from in this region, let's take a closer look at each one. Makena Cove is stunning sight to behold with wondrous soft white sand, beautiful black lava rocks and lush green palm trees surrounding the area the Makena Cove is an oasis made real and a beautiful choice for a Maui wedding venue. Sometimes called the Secret Beach the Makena Cove is ideal for smaller weddings has no chairs or structures are allowed on the beach but who would want to stand with the amazing views and scenery on offer? This beautiful venue is sure to make an amazing backdrop for your wedding photographs and will leave you and your loved ones with treasured memories of a truly special day. Magnificent Maui wedding venues aren't always about the beach, located on the Wailea Gold and Emerald Golf Course Gannon's offers you stunning mountainside views of Haleakala and a truly awe inspiring ocean view of the Pacific. With beautiful surroundings and on site award winning chefs and an amazing restaurant Gannon's is also the perfect venue for your after wedding reception. You also have two ceremony sites to choose from, the ocean views of the Wedding Knoll or the more intimate and remote setting of the Molokini Lookout located on the summit of the golf course. Plus there's a range of reception locations both indoors and out, whatever you're looking for in a Maui wedding venue Gannon's will have something you'll love. Located in central Wailea and offering stunning sunset views the Paluea "White Rock" Beach is a little corner of paradise and a stunning example of the beautiful Maui wedding venues you can find in Maui. Featuring a large open beach, beautiful palm trees and lava rocks this charming beach is sure to make a great backdrop to your wedding photographs. Our second group of marvellous Maui wedding venues are found along the west side of Maui and again offer a range of different venues each with their own personality and charm. Found closer to Lahaina, Kaanapali and Kapalua any of these venues would make a great choice for your wedding, but to help you decide which is the best for you let's take a closer look at them. The Kapalua Bay is famous for many reasons the stunning beach found there is a common site in the top ten lists of Hawaii's best beaches and due to being located between two coves many people from around the world travel there to enjoy the sights and snorkelling. But it is also one of Maui's finest wedding venues and ideal for ceremonies both small and large. Located in central Kapalua with multiple access points the Kapalua Bay is very large and open making it ideal for larger weddings with lush white sand, beautiful lava rock formations and swaying palm trees it's everything you could want in a Maui wedding venue in one spot. The views of the neighbouring islands and stunning sunsets also make it a beautiful place for wedding photography. A picturesque paradise the divine DT Flemmings Beach is one of Maui's most beautiful wedding venues! With wondrous bright white sand and smooth and rough lava rocks the natural beauty on display in this Maui wedding venue is literally breath-taking. The glorious beach and rock formations compliment the tranquil, relaxing water perfectly to create a truly special setting. It's everything you could want from a Maui wedding venue and is sure to make a magical setting for your wedding ceremony and photographs. The incredible Iron Woods Beach is found in the cooler area of Kapalua and is one of Maui's more private beaches. If you're looking for a more tranquil, relaxed or intimate wedding then this is the Maui wedding venue for you! Incredible cliffs and rock formations surround the beach front making it the perfect backdrop for some truly special wedding photographs. Affordable Package For Any Wedding! At Just Maui Weddings™ we know that no two weddings are the same that's why we pride ourselves on our amazing selection of Maui wedding packages! From luxury weddings, to last minute ceremonies, budget weddings and much more you'll find our Maui wedding packages cover everything you could need. Your personal events planner will work with you at every step to help you find the Maui wedding package that is right for you! 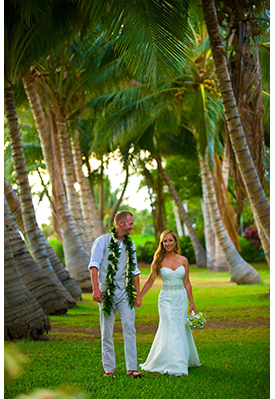 With a great range of Maui wedding venues and Maui wedding packages your dream Maui wedding really can come true.